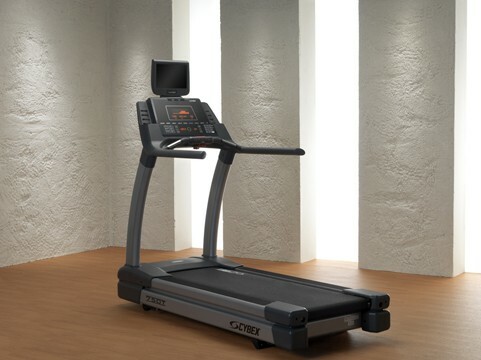 The CYBEX 750T treadmill is the ultimate effective and efficient workout for members while gym owners get a new level of reliability and performance. A powerful motor makes the 750T treadmill a durable machine that stands up to the harshest commercial environment. But the CYBEX 750T is a lot more than a tough guy - it is simply gorgeous with great programming. The deck has an intelligent suspension design which makes it not too hard - not too soft - just right. And the big running surface is designed to be rotated and flipped - 4 times the running time of a standard deck. The 750T is truly the top of the line. TOP OF THE LINE The CYBEX 750T treadmill is the ultimate effective and efficient workout for members while gym owners get a new level of reliability and performance. A powerful motor makes the 750T treadmill a durable machine that stands up to the harshest commercial environment. But the CYBEX 750T is a lot more than a tough guy - it is simply gorgeous with great programming. The deck has an intelligent suspension design which makes it not too hard - not too soft - just right. And the big running surface is designed to be rotated and flipped - 4 times the running time of a standard deck. The 750T is truly the top of the line.